WiLEES is a newly designed wireless car charger.Owe to the infrared induction and automatic telescopic levers, there is no need to put a sticker or worry about unstable levers any more. Simply insert WiLEES into the air vent, put your phone on , charging will soon be initiated. Enjoy a safe and convenient driving with WiLEES wireless car charger. 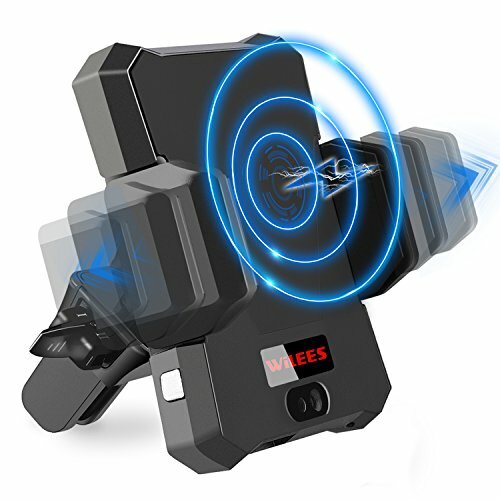 Single-handed Operation: automatic wireless charging in the car; advanced infrared sensor system.The clips will open automatically when the phone is near and clamp after a short pause - smooth operation to ensure safety. The perfect combination of phone base and wireless charger. QI Wireless Charging: wireless charging system based on QI protocol; compatible with all QI-compatible mobile phones, such as Samsung Galaxy S8 / S8 plus, S7 / S7 Edge, Note 8 and standard charger compatible iPhone X, 8/8 Plus. Other commonly-used phones can install QI receivers to enjoy wireless charging, away from the charging cables. With cases (not metal) between 2-4mm on the phone, WiLEES can work without any problem. Dual USB Car Charger: WiLEES qi car charger comes with a 1m micro USB cable and a dual USB charger for WiLEES wireless car mount; more flexible when charging other devices. We would highly suggest you to use the the high quality dual car charger and USB cable comes with the WiLEES charging car mount in your car. AIR VENT MOUNT: Compared with windshield or dashboard mount, the air vent mount is much easier for you to reach the phone in the car and causes less distraction during driving. Easy to adjust full 360-degree rotation for the perfect viewing angle. What You Get: WiLEES QI Wireless Charger body×1, Dual USB Qualcomm Quick Charger 3.0 ×1, Air vent stent×1, Micro USB cable×1, Warranty Card×1, Instruction Manual ×1 and Our high quality service. Our warranty time is longer than others as our quality is guaranteed. We warrant this device 12 Months from date of the original purchase for manufacturer defects. If you have any questions about this product by WiLEES, contact us by completing and submitting the form below. If you are looking for a specif part number, please include it with your message.